This is a bold statement to make in 2018. Given the way art is consumed in our current digital Wild West, to be living solely off of created work to the quality of art created. B. Dolan – a Providence-based rapper, musician, and screenwriter – is the kind of person who can make the term “artist” work as a personality trait and as a job description. As a true renaissance man, B. Dolan has worked on a diverse array of projects since first emerging as a slam poet in New York City in 2002. Since that time, he has recorded hip hop albums, EPs, mixtapes, worked on films, and even ran a consumer activist website called KnowMore.org. Earlier this year he released Epic Beard Men Season 1, an EP with frequent collaborator and partner in rhymes Sage Francis, and together they’re finalizing a follow up full-length release. Currently he’s scoring the locally shot and produced film Vault, which he also co-wrote. Between all that, he managed to find the time to take Epic Beard Men on the road with Sage for a tour that took them all across the US and as far as South Korea. Since returning from tour, Dolan has been hard at work scoring Vault, which tells the story of 1975’s infamous Bonded Vault Heist in which a group of men broke into the Hudson Furs Vault, the “unofficial bank” for the Patriarca Crime Family, and made off with upwards of $30 million dollars worth of valuables. 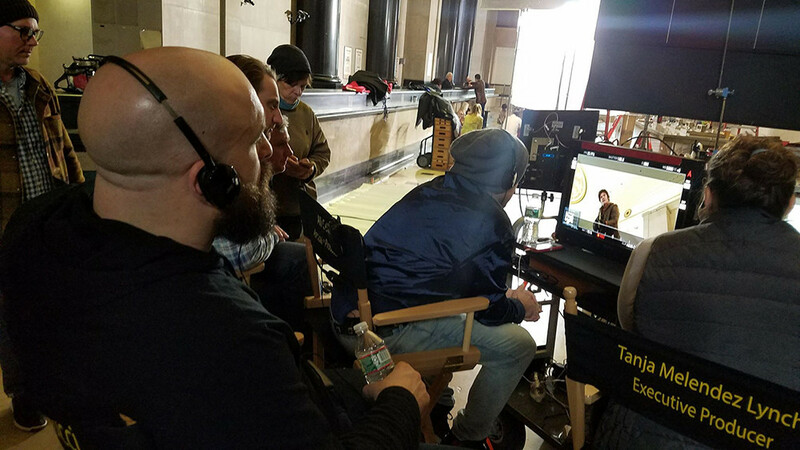 The film is being produced by the East Greenwich based Verdi Productions, and Dolan co-wrote the script with another frequent collaborator, local writer-director Tom DeNucci. Filming took place in Providence earlier in the year, and the cast includes Sons of Anarchy’s Theo Rossi, Orange is the New Black’s Samira Wiley, and A Bronx Tale’s Chazz Palminteri as Raymond Patriarca. For Dolan, writing scripts for movies has been a kind of antidote for writer’s block and this current project is no exception. “I was originally approached by Tom DeNucci, who I’ve written a number of movies with, about the idea that became Vault. As soon as he asked ‘Have you ever heard of the Bonded Vault Heist?’ I laughed and said yes to the movie. I didn’t need to hear another word,” Dolan says. Work as a collaborator on Vault helped Dolan to let go of some control over his work. Where he might obsess over the placement of a comma or breath in his own music, co-writing afforded him the opportunity to “let go” of his part and see what other artists make out of his blueprint. An inescapable part of the B. Dolan persona is his engagement as an activist fighting for social justice and corporate responsibility. An investigation he launched through his now-defunct website knowmore.org on American Apparel then-CEO Dov Charney even resulted in Dolan being called to testify against him in a sexual harassment trial. Whether it is through his writing or his music, Dolan uses his platform to comment on the things he finds unjust in society. However, between the light-hearted persona of Epic Beard Men and his work on Vault, some of B. Dolan’s more outspoken tendencies have taken a back seat to allowing his known views to speak for themselves. That doesn’t mean they are any less angry. Dolan goes on to point out that, “the current social climate represents a kind of ‘mask off’ moment to our generation, I think. No one can deny what’s happening. No one really needs to be told. You’re either Big Mad or you’re little mad, or not mad at all. Should we make a rap song about the child detention centers in Texas? Or should we raise and send money and support to those working to close them immediately?